She's Sew Crafty: Mo's DT Monthly Blog Hop!! Good morning all! It's time for another blog hop with the lovely ladies of Mo's Dream Team! This month I am host and I have chosen the theme to use Distressing Techniques! I love inking and roughing up my paper edges, so I thought I would choose an easy theme for me, hehe! I have used a new digital stamp called Paddy, which you can find at Mo's Digital Pencil. He is so perfect for St. Paddy's Day coming up in March! I used my Silhouette to cut out my card base and the pot o' gold, which I designed in Silhouette Studio. I used Aged Gold Frantage to make my gold for the pot and sprinkled some around my image along with some Shabby White. I inked the edges with Vintage photo and roughed them up. 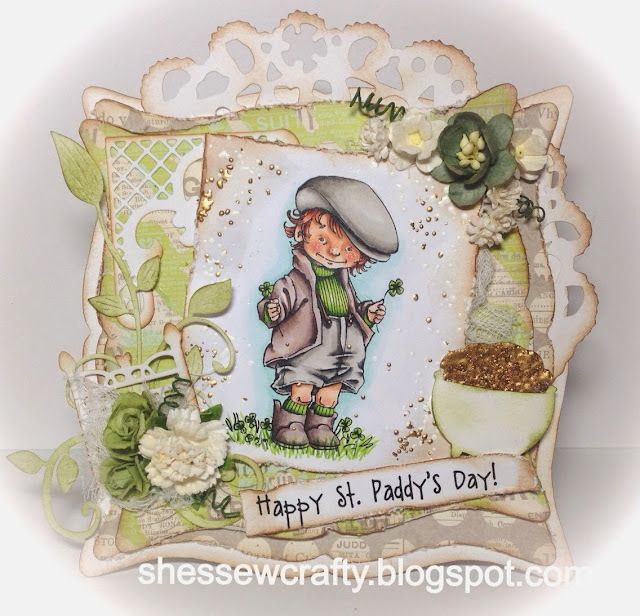 I hope you like my little Irish lad and don't forget to comment here at at each stop of the hop for your chance at Mo's Digital Pencil prize! This is the first stop of the hop and your next stop is the lovely and talented Kaly! wauwwww he is so sweet, i love this stamp. Such s sweet card! Love it! Fabulous card! I love your pot of gold. Wow, gorgeous, Danielle! Lovely colors. oh my gosh, he is adorable and what you have done with the layers and distressing is so lovely! 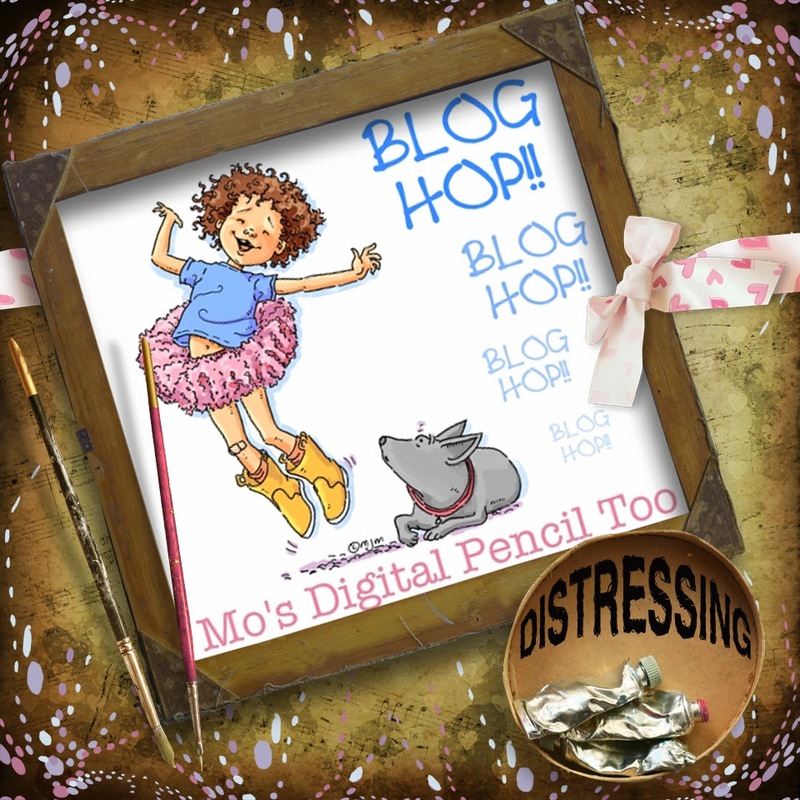 I love Mo's Blog Hops - what a happy day!!!!! I'm in love with your way of coloring!! Beautiful card! Love the new image and green shades you have used! simply wonderful, love all the little details. Love this cute guy!! Beautiful card and great theme! Gorgeous card, I love the distressing & all the little details you've included! Thanks for joining in with the fun at The Crafting Cafe this time! Eek this is awesome, amazing card and coloring. Stunning card, such an adorable image coloured so beautifully and your detailing is amazing. I love this image with his rather large cap and clasping a four leaf clover in each hand. Nice muted colours but definitely got the Irish green. Love the gold and the flowers and leaves to finish. Absolutely beautiful!! Fantastic coloring...love your distressing...and that pot of gold is fabulous looking!! Great card and gorgeous image! Thanks for joining in with the Whimsy 'Something New' Challenge. What a wonderful card, I love all the layers and your colouring is amazing. Thanks for joining us at Whimsy Stamps. Oh what a fun image and GREAT coloring, I love the layered look of your card, I wish I could do something like this myself :) Thanks for joining us at ATSM! OMG...this is the cutest ever!! How lovely and your colouring and idea are just fantastic!! I soo much love this card!!!! Gorgeous card! That image is sooo cute! I love him. Think I really need him. Great card! I love this, especially the pot of gold. Thanks for joining in at Penny's. This is gorgeous, Danielle. Fabulous coloring of the image and wonderful design.